What do you think of when you hear the words lazy dog? Maybe you envision the familiar sight of a dog seeking out the softest spot in the room, scratching it up just right, turning a few circles, and plopping down for a nice little four-hour nap. Or maybe it’s the classic Lady and the Tramp image of a droopy old hound spread out on a hard wooden porch. In any case, it’s probably not a Jack Russell Terrier you’re thinking of. Jacks, as many weary owners can attest, are anything but lazy. If you’re looking for a ridiculously mellow dog – and many people are, as they’re lower maintenance – you might want to turn your attention to one of the following breeds. These, as far as we can tell, are the laziest dog breeds on the planet. 10. Great Dane. Great Danes are lazy because, well, can you imagine if they weren’t? A 200-pound dog bouncing off the walls doesn’t make for a happy home. 9. English Bulldog. Looking at the stocky physique of a Bulldog, it’s pretty apparent that they don’t get much cardio. Rather than chase a ball, they’d rather be laid out somewhere, possibly on their back, with loud snores pouring out of their brachycephalic (smushed) faces. 8. French Bulldog. In breed descriptions, Frenchies are often described as docile, easygoing, and quiet, with minimal exercise needs. All euphemisms for lazy. 7. Shih Tzu. Mellow small dog breeds are hard to come by. Along with the Chihuahua and Maltese, the Shih Tzu is often cited as a laid back breed that likes nothing more than to hang with its owner. Still, these guys can only be considered lazy in comparison to terriers and other zippy little dog breeds. They’re lively compared to the heavyweights on this list. 6. Greyhound. This one might surprise some people, what with Greyhounds being known for their racing prowess. But it’s true – most of these docile pooches would rather stretch their log legs by the fire than run around a track. 5. Bullmastiff. Another very large breed that seems overly troubled by gravity. If you’re going to get one of these dogs, you might want to pick up an extra couch as well. 4. Chow Chow. These dogs are sometimes described as looking like a cross between a lion (lounges on the Savannah) and a bear (hibernates all winter), with the temperament of a house cat (sleeps 25 hours a day). With a pedigree like that, it’s no wonder these aren’t the most energetic dogs. 3. Saint Bernard. You can’t blame Saint Bernards for being lazy. You’d be lazy too if you walked around with that cozy coat on all the time. It’s like wearing a Snuggie 24/7. 2. Bassett Hound. 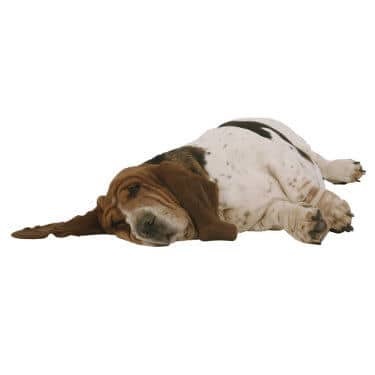 Short, squat, and a little saggy, Basset Hounds certainly have the appearance of a very lazy animal. Like all dogs, they can get bursts of energy, especially when small critters are afoot. The rest of the time, they’re happy to chase critters in their dreams. 1. Newfoundland. The Newfie, dubbed the gentle giant, requires encouragement to exercise. Actually, encouragement is probably an understatement. These dogs are so lazy that they may simply refuse to move, which is a problem when you’re talking about a 100-pound dog. Sign up for email updates, and we'll let you know whenever a new Terribly Terrier article comes out.